I started a Thankfulness project on Facebook 30 days ago. I'm writing down something I am thankful for everyday to take some time to reflect and by doing so, I hope it will give me a more positive outlook and maybe it can encourage other people as well. I thought it would be fun to compile the list and post it every month. Day 2. Grateful for an extended (although unexpected) time in Holland, including wishing my niece a happy 5th birthday! Day 3. Thankful for a safe and uneventful trip back to Freetown. Day 4. Thankful for a fairly smooth first day with some chaotic moments and a heightened sense of caution but many welcoming colleagues. Day 5. Thankful to know that "He is my Refuge and my Fortress". Day 6. Thankful that one of my friends arrived in Sierra Leone this evening! It was fun to surprise her at the water taxi. Welcome back! Day 8. Thankful that I can sleep in a little bit tomorrow. Heading in to work at 9 am instead of 7:20. Day 9. 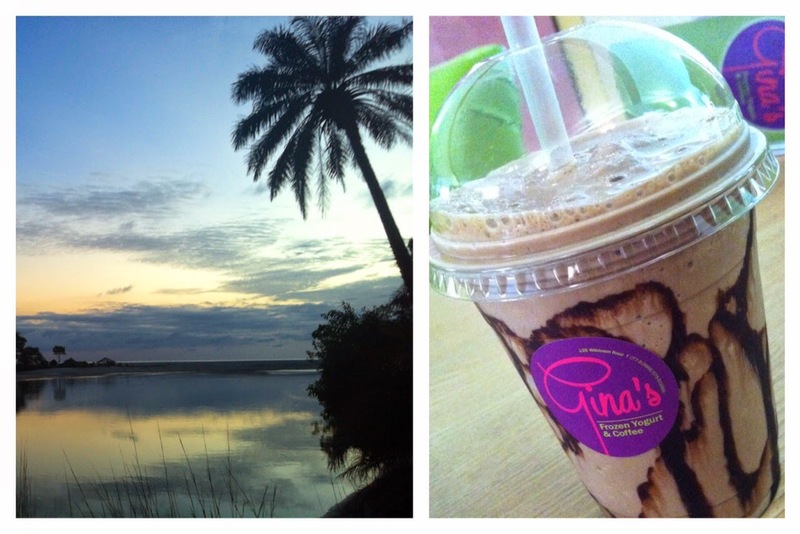 Thankful for a chocolate milkshake at Gina's. Definitely a perk when actually there for a work meeting. Day 10. Concept note written for world bank funding - urgently need to make sure they or someone funds the Free Health Care Commodities (drugs etc) so that there is no stock out in January 2015! This is essential to ensure ongoing maternal, neonatal and child health care services in the entire country. Should get some feedback and then forward it on to the Ministry and they can take it from there. Day 11. Thankful for King's Sierra Leone Partnership and the work they are doing at Connaught Hospital. I met some of the team yesterday and saw parts of their isolation set up/operations there. Great people doing a difficult job. Day 12. Thankful to catch up with a small group of Dutch colleagues and meet one of the Dutch embassy people visiting from Accra headquarters. Day 13. Thankful to meet up with friends and resume our 'International Bible Study Group' prayer time. Encouraging! Day 14. Thankful for lab results - we finally got some results after days of not receiving any. Day 15. Thankful for some time at Roy's restaurant on Lumley beach this evening. Day 16. Thankful for a productive Saturday - lab packaging handed over to the lab staff at the hospital (to hopefully speed up delivery of specimens to the lab), meeting with one of the Welbodi Board members, talking about infection control in hospitals with a colleague and enjoying fast internet at Country Lodge. Day 17. Thankful to spend the day at the beach with friends. Sun, Sea, Fish, Chips, Sand, Playing, Chatting. An all around good time with friends. Day 18. Hmmm. Thankful for a yummy meal of pasta. Day 19. Thankful for a good day although a very long one. Calling it a day now. Day 20. Thankful I wasn't hurt (just a slightly bruised hip) when a vehicle backed into me from behind today on the hospital compound. And thankful for the nurse that pushed me to the side. Daily prayers for continued health and safety are welcome. Day 22. Thankful for a good Skype connection to communicate with our Director of Operations in the UK. Day 23. Thankful for one of my friends and that I can celebrate her birthday with her today - heading to the beach later today. Day 24. Thankful for an overnight trip to the beach. First time at Cockle Point. Day 25. Thankful that the ODCH holding unit opened yesterday, starting with the transfer of suspected cases from the isolation area in the Emergency Room to the holding unit (support centre, donated by Cap Anamur, a German NGO, and they will also support the running of it), which is located on the compound next to the hospital with an access gate to the hospital compound. It has 3 wards for suspected cases (low, medium, high risk) I'm not directly involved, but may provide coordination support when needed. Two more patients were admitted today, of which one was a transfer from another facility. We have 4 patients with positive results awaiting transfer to a treatment centre (but the treatment beds are full). This is a positive step forward but there are still many challenges. Day 26. I am so thankful for the email I received from a friend today saying that he is doing much better but still in Frankfurt recovering from Ebola. Thank God that he is beating this. Continuing to pray for his full recovery and release from the hospital (hopefully soon). Day 27. Thankful it's bedtime. Feeling rather exhausted today. Praying for a good nights rest and a productive day tomorrow! Day 28. Thankful that I was able to contribute to the International Child Health Group Winter meeting today. I joined the conference through Skype and provided the attendees with a brief overview of Welbodi Partnership and gave an update on the Ebola outbreak, recent developments and the many challenges. Afterwards there was time to answer questions from the audience. It was insightful and enjoyable! Day 29. Thankful that people are finally seeing the importance of training hospital staff on infection prevention and control (IPC) so that they can safely provide regular care for non-Ebola cases. It's so important! Preliminary findings show that 60% of the health workers that have been infected with Ebola in Sierra Leone were infected in the non-Ebola areas of the hospitals, 20-25% in the primary care facilities, and the rest probably in either private practice, community settings, and Ebola units. I've been tasked to co-chair a committee with CDC focusing on training hospital staff in IPC. Day 30. Thankful to have just made a teenager very happy by telling her she does/did not have Ebola. She was on her bed in the ward and I was standing in the visitor area within a 2 meter distance from the ward. She has been in the unit for 5 days and was eager to go home since she was no longer sick. I dropped off the discharge pack of clothes, slippers and transport money, so once she has showered she can head home. Mind you, for the next 21 days she will need to be monitored, in case there was any exposure in the unit. Praying she stays healthy!